The origins of the metric system can be traced back to 1799 during the French Revolution. Fed up with the existing units of measurement, the French Republic implemented a new decimal system based on the kilogram and the metre. Initially, the system didn't last. France reverted back to their old system in 1812. But then in 1837 it was once again adopted by France, and this time it stuck. The International Committee for Weights and Measures (French: Comité international des poids et mesures- CIPM). International Bureau of Weights and Measures (French: Bureau international des poids et mesures - BIPM). 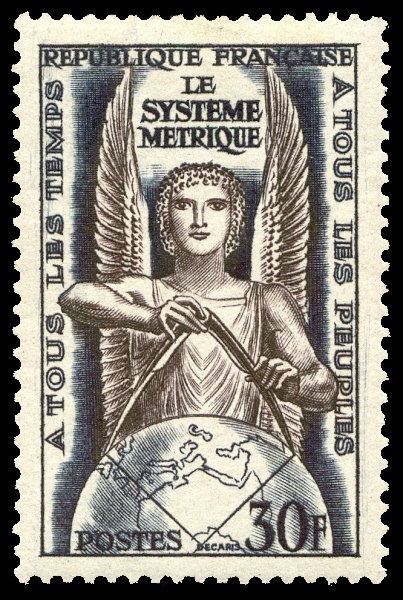 On 6 October 1954 France issued a stamp to commemorate the 10th General Conference on Weights and Measures (number 3 on the list above). The stamp was designed and engraved by Albert Decaris. 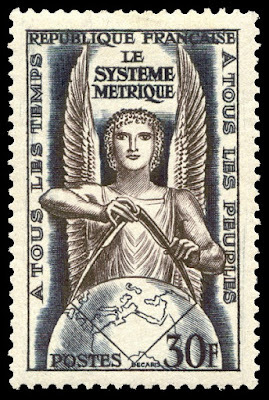 This beautiful stamp depicts the Angel of the French Republic measuring a meridian arc across the earth. Decaris has captured the far-reaching impact of the metric system in a profound way. Stunning!